A 38th minute Sean Reid goal was followed by Robert Dale’s 44th minute penalty on the brink of half time turned the game on its head – after an early goal from Trinity’s Shane Clarke gave the hosts the lead on nine minutes. Along with the safe passage to the next round, Spartans have earned £15,000 for the exploits against Gainsborough. Manager Alun Armstrong kept faith with the same side that won 1-0 against A.F.C. Telford United las weekend with Dale continuing in the centre, with Jamie Holmes on the left. But it was the hosts who dominated the opening salvos and took the lead in the ninth minute. An Alex Byrne set-piece bounced around the penalty area before it fell to Clark who swivelled on the spot and found the bottom left hand corner. Three minutes later the lead was nearly doubled, a mistake allowed Ashley Worsfold in on goal – his audacious effort with the outside of his foot sailed wide. On the quarter of the hour Peter Jameson was forced into a last ditch save after Byrne’s right win cross was turned goalward by Alex Simmons at the back post. With 22 minutes played Spartans began to turn the game on its head when Holmes was scythed down on the edge of the area by Joe Maguire. Dale stepped up from 20 yards out just left of centre, hitting an effort under the wall, and the base of Jon Stewart’s right hand upright. With 38 minutes on the clock Spartans equalised in somewhat fortuitous fashion. Dale’s Crossfield ball was under hit and kindly fell to Reid who moved the ball onto his right foot before stroking the ball into the bottom right hand corner from 18 yards out. Two minutes later Spartans almost took the lead, Adam Wrightson’s ball in the box was knocked goalward Reid, Nathan Stainfield with a diving block to maintain parity. Dale stepped up and slotted the ball into the bottom right hand corner as Spartans took the lead at the break. The second half saw a procession of Blyth chances, with Trinity defenders throwing their bodies on the line to keep the score respectable – with Wrightson notching a hat-trick of chances. The first fell on 56 minutes when a well-executed counter-attack, Wrightson bursting down the right with his explosive place – his shot arrowing wide of the left hand upright. With 14 minutes remaining – Gordon made a phenomenal diving block to deny Wrightson’s vicious half volley. A minute later it was Stainfield with vital block as he denied Dan Maguire a third goal in three games with the ball destined for the back of the net. Six minutes from time the hosts thought they’d equalised. Byrne’s right-wing corner was met at pace by Joe Maguire – his header wide of the target from inside the six-yard box. There was still time for Wrightson to be denied Spartans’ third when Gordon again dived in the way of his shot from the right, deflecting it wide. 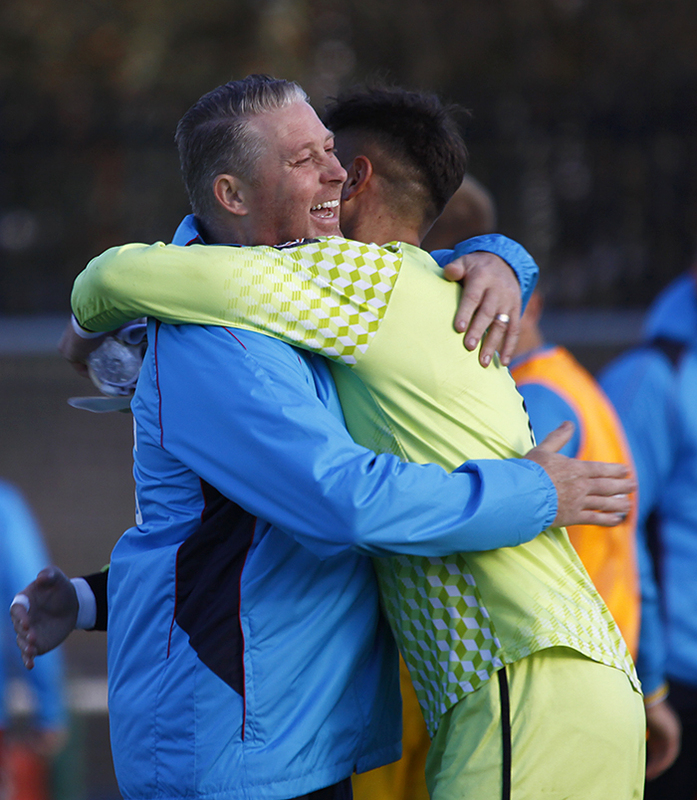 Despite five minutes injury time, Spartans held out to put their name in the hat for the fourth qualifying round for the first time since reaching the third round proper in 2014/15. Spartans now face a trip to Boston United next Saturday in the Manarama National League North – looking to extend the sides winning streak to four games. Blyth Spartans: Jameson, Nicholson, I Watson, Green, Buddle, J Watson, Wrightson (Fewster), Reid, Maguire, Holmes (Oliver), Dale (Rivers). AFC Telford United: Stewart, Ture, Gordon, Clarke, J Maguire, Stainfield, Russell, Worsfold, Hannah, Simmons (Reeves).